Classic Croquet in One Deluxe Set! Play the classic game of mallets, wickets, and ball all in one convenient set. 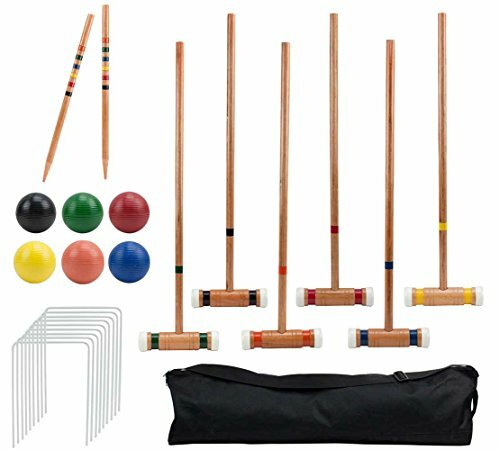 Our Croquet game includes six 32" hardwood mallets with rubber caps, two 21" hardwood stakes, nine vinyl-coated steel wickets, six 3" all-weather polymer balls and a black, zip-up carrying bag. It's quick and simple to set up, all you need is the sporting equipment and any grassy surface or open field. Croquet is ideal for barbeques, picnics, family reunions, parties, and more, as it's easy to understand for players of almost any age. Most Croquet games are played with four to six people. The object of the game is to use a mallet to hit the ball through the wickets and into the stakes. A traditional Croquet field is set up with nine wickets in a diamond formation. The first player to successfully navigate through the wickets wins. Follow the color order to decide who hits first: blue, followed by red, black, yellow, green and orange. Croquet is an easy-to-play game, with a simple set up that has you playing on any grassy surface in minutes. You can take it anywhere as our deluxe set comes with a durable, black carrying bag that holds all equipment in one place. Simply put the carrying strap over your shoulder and you're ready to go! Put it in the back of a car and bring it to parties, camping trips, and family gatherings. Our set comes with six matching sets of color-coated mallets and balls. STURDY MATERIALS: 2 high-quality hardwood stakes that are 21" long, 9 vinyl-coated wickets, and 6 polymer balls will last for many backyard fun days to come!